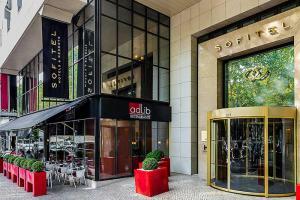 Located in the heart of the Portuguese capital, the luxurious Sofitel Lisbon Liberdade hotel offers unique accommodations reflecting the country's history. The 163 guestrooms and suites feature modern yet chic décor. Step onto your private terrace for magnificent view of Avenida da Liberdade. Enjoy traditional French and Portuguese cuisine at Ad-lib Restaurant. Located approximately 5 miles from Lisbon Airport.